Active shooter incidents have been on the rise throughout the United States. Recent FBI data has identified 250 active shooter incidents between 2000 and 2017, in which 799 people were killed and an additional 1,418 were wounded. In the first half of that period, there was an average of 6.7 incidents per year. That number has tripled to over 20 incidents per year in the second half of that period. Four percent (10) were in healthcare organizations. The active shooter’s motives usually are much more personal, targeted and focused. Necessary security measures are often harder to undertake. Healthcare providers feel compelled to stay with their patients. Certain patients will die without continued life support in ICU’s and operating rooms. Certain areas of hospitals are not easy to harden or evacuate. Most hospitals are organized vertically and rely heavily on elevators. Emergency departments may lock down or shut down during an event. The violence could end in less than 10 minutes, but the healthcare delivery disruption could be prolonged. Many healthcare shootings occur at entrances or just outside buildings. Healthcare facilities cannot easily shut down for training. 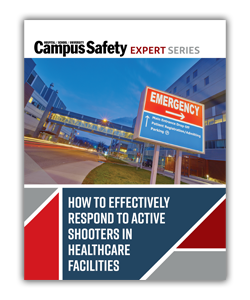 The “run, hide, fight” response to an active shooter may work in many venues and for certain areas of hospitals, but healthcare facilities should consider a different approach for areas where “run, hide, fight” is not possible.